Happy National Ice Cream Month to all you lovely people out there! I hope you’ve been doing your part to celebrate by eating a pint a day. I know I have! Janette and I are currently visiting cities around the U.S. to eat at their best ice cream shops. Sounds like a tough job, right? It totally is. And you’d think that I’d get sick of ice cream. Nope, not possible. When I’m home in between trips, I often find myself having severe ice cream withdrawals. To fix this, I figured I should whip up a batch of my own. After eating Big Gay Ice Cream’s “Lunchbox”, which has strawberry jelly filled peanut butter cups, I was inspired. I had honestly never really thought of peanut butter & jelly cups, much less putting them in ice cream. Genius! It’s no secret that I’m a fig super fan, so my first thought was to use this wonderful Port Wine Fig Spread that my friends at Valley Fig had sent me. Classing it up with the fig spread made me feel like I should kick the rest up a notch as well. I decided to forgo milk chocolate and use dark instead, and almond butter in place of peanut. The dark chocolate fig spread & almond butter cups could not have turned out better! They are even a wonderful dessert by themselves. I love the fact that they are mini too. So easy to eat them by the handful! ? To make the mascarpone ice cream, I used a custard base and added 8 oz of mascarpone. If you aren’t familiar with mascarpone, it has a light, yet rich and creamy texture. 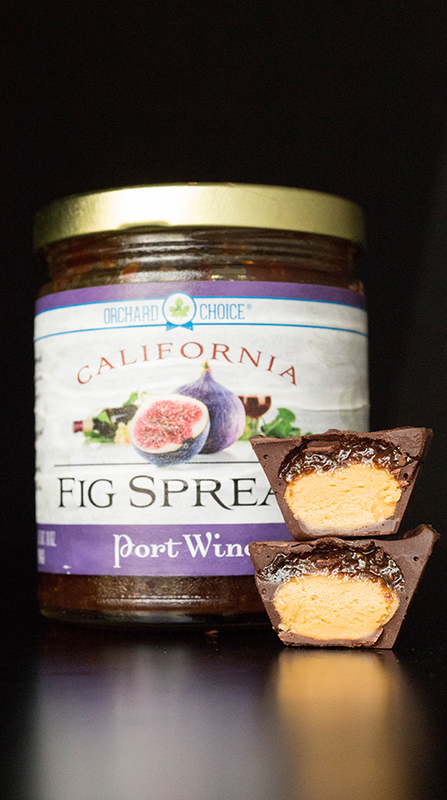 It helps to bring out the rich flavor of the dark chocolate and the sweetness of the Port Wine Fig Spread. The fig chips I used as a garnish were made by slicing black mission figs about 1/4″ thick and placing them in a dehydrator at 95 degrees F for 14 hours. 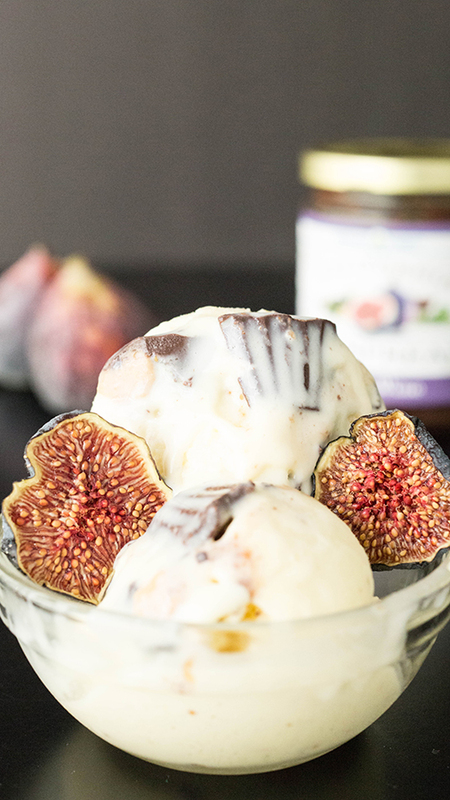 The Port Wine Fig Spread for this recipe was provided by Valley Fig. Place the almond butter and butter in a large mixing bowl. Use a handheld mixer and beat together until creamy and well-combined (1-2 minutes). Sift in the powdered sugar and beat until soft dough forms. Roll the almond butter mixture into little balls in the palms of your hands. Set on a parchment paper lined baking tray and store in the fridge. In a double boiler, (I use a large glass pyrex bowl over a saucepan) melt the chocolate while stirring constantly until it is silky and smooth. Remove from heat, but keep the chocolate over the saucepan so it stays warm. Add just enough chocolate to cover the bottom of your peanut butter cup mold. Take an almond butter ball, flatten it just a little using your fingers, and place it on top of the chocolate. Make sure that the almond butter does not touch the sides so that the chocolate can fully cover it. Place some of the fig spread on top, then spoon the dark chocolate over the top so it is completely covered. Store in the refrigerator at least one hour until set. When set, cut them into quarters or chop to add into the ice cream below. Store leftovers in the refrigerator. Place egg yolks and 2/3 cup sugar in a large bowl. Use a handheld mixer to beat until well combined and creamy (about 3 minutes). Add the milk and 1.5 tablespoons sugar to a saucepan. Bring to a simmer over medium-high heat while stirring. Remove from heat and slowly beat it into the egg mixture. (It is important to add it slowly so you do not “cook” the eggs). Once combined, pour the new custard mixture back into the saucepan. Cook over high heat, stirring constantly until it is thick enough to coat the back of a wooden spoon (about 5 minutes). *Be sure not to let it boil. Pour into a glass bowl that is sitting in a larger bowl of ice water. Stir in the mascarpone, lemon juice, and salt. When ice cream mixture is completely chilled, transfer to your ice cream maker and follow the manufacturer’s instructions. 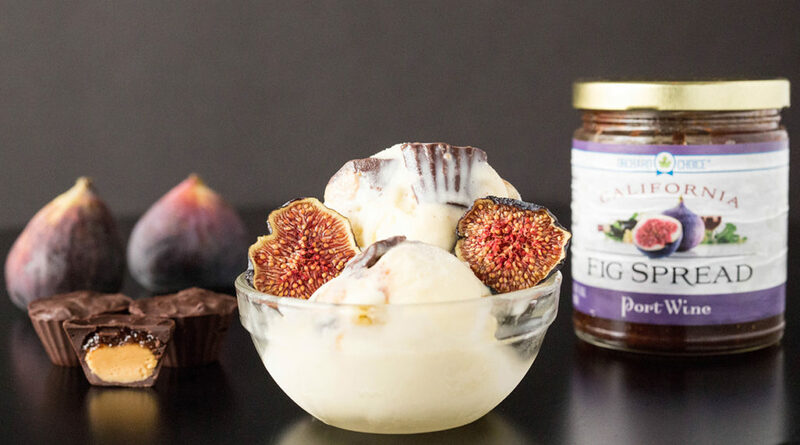 Be sure to stop the ice cream while it is still soft, and add in the chopped fig almond butter cups. (I use the KitchenAid ice cream attachment. I churn the ice cream for 10-13 minutes, then add the fig & almond butter cups, mixing with a spatula). Transfer ice cream to an airtight container ( I like to use this one, a bread pan with saran wrap can work in a pinch) and freeze at least 2 hours, or until the desired consistency is reached. Holy smokes, this looks so decadent and delicious! I love figs, too. Yum!